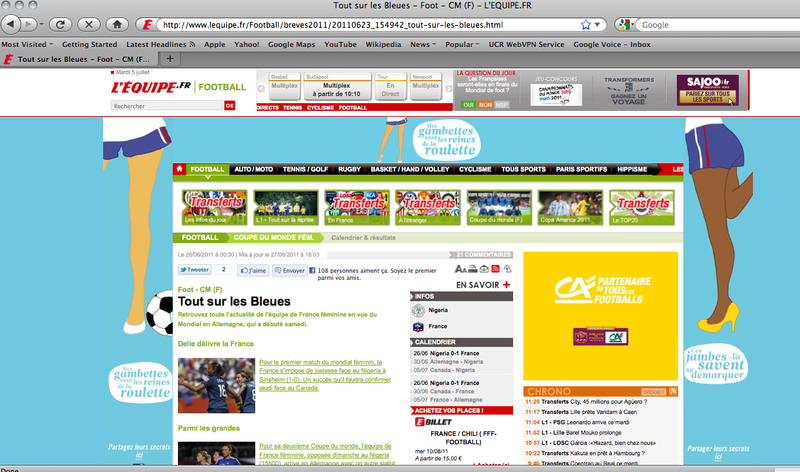 From A Left Wing: 2011 Women's World Cup: File under "More Crap Marketing"
2011 Women's World Cup: File under "More Crap Marketing"
So, this morning I wanted to read "tout sur les Bleues," in preparation for this much anticipated match against Germany. I was so absorbed in the football, it took me a few minutes before I noticed the leg action on the right and left margins. This appears to be part of a publicity campaign for the team - "These legs know how evade one's marker." Or, as we would say in English, "These legs know how to stay open." The double entendre in English is the opposite of what it means in French. In French, it means more properly how to avoid being trapped or cornered. 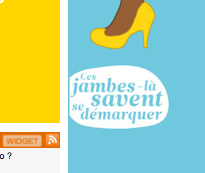 Anyway, just one more detail in the weird FFF marketing of "les desmoiselles de Clairefontaine" - cartoony lady legs in high heels. Legs - not players, mind you, but legs are the "queen of the pitch." Sigh. The carving up of the female body into parts is a foundation of advertising, turning those female body parts into product hardly discernible from that being sold to you. You want not the shoes, but the legs. French photographer Guy Bourdin pushed that practice to its limit - I leave you with one of his older photographs (1970s?) advertising pantyhose? Shoes? Who can tell!? Guy Bourdin - provocative French fashion photographer (known largely for his work with Charles Jourdan shoes).